There's a new food app in town...in your town and my town...everybody's town! It is Nick Jonas' new free app called Yood. The purpose of the app is to help you find the single best place to eat where ever you may be. That's right, single. There are no decisions to be made with Yood. The decision is already made for you. Well, there is one decision you need to make. You decide what KIND of food you want to eat. Yood breaks it down into food categories, so if you have a hankering for pizza, you can click on the pizza bar and, Bingo! You have one pizza restaurant suggestion. 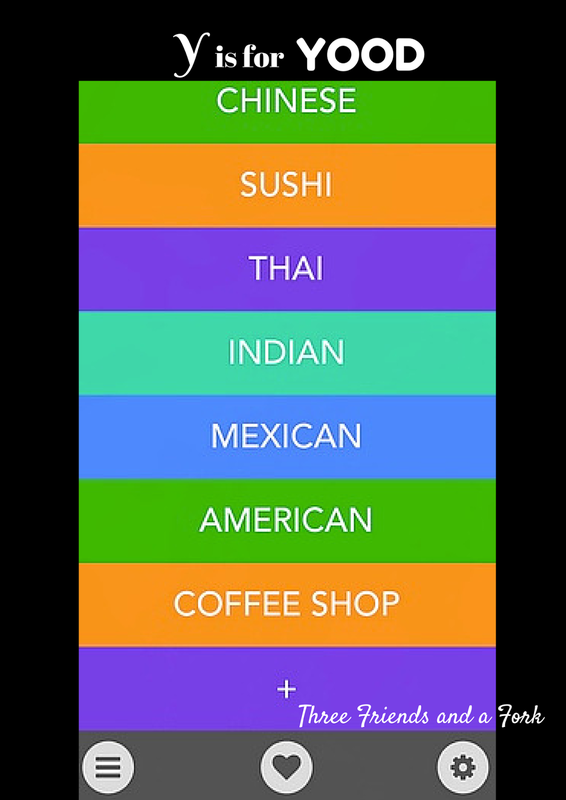 Yood starts out with eight categories: Pizza, Chinese, Sushi, Thai, Indian, Mexican, American and Coffee Shop But you can also add categories. For instance, there was no barbecue bar, so I added that. I also added Greek, Breakfast, Bakery and Italian. If you want Moroccan or French or Vegan, you could add those. It is up to you and then it isn't. Yood takes over from there and gives you driving directions. I clicked on each of the categories to see what came up in my small town. Here is what I got. But then I noticed, if you click on a category again, you get a different suggestion. So, if you get a suggestion you know you aren't interested in, you can get a different choice. Let's say, you really want Mexican, but you want a nice, sit down restaurant, not fast food, but Yood gives you Taco Bell or Chipotle. You can click again until you get a suggestion that fulfills your criteria. I tried all the categories again and this is what I came up with. This time a couple of the app's weaknesses came to light. First, it pulled up Big Marv's BBQ in Scottsboro. Big Marv is no longer in Scottsboro. The business has changed locations and is now in Tennessee. Second. Buenavista is a wonderful place for Mexican, but I have never gotten nor seen any Italian food there. I am not familiar with Cashew, but unless it is both a Thai restaurant and a bakery, Yood may have made another mistake. Also, when I first installed the app and clicked on the bakery category, I did get our local bakery, The Variety Bake Shop, so don't think the app did not pull it up first. I am not sure how often it takes for a restaurant to come around again, but the Variety did not pop up when I was getting these two lists, so apparently the app is thinking, "I already suggested that and she is still asking, so she must want something else". I did hear Nick Jonas say the app uses Yelp and other sources to determine which restaurants to suggest. That means if a lot of people in your town go to Yelp and Urban Spoon and rate your restaurants, you can help determine the choices. It also means higher end restaurants might not get suggested over more economical ones because people tend to rate a little harsher when they are spending more money. Expectations rise with the price. The app throws all the restaurants into the same pot, so you may have the best seafood restaurant ever, but it is a little on the high end side. That restaurant is thrown into the same category as Captain D's, which may be rated higher because the prices and expectations are not the same as they are for the higher end restaurant. Even though they are both seafood restaurants, Yood is not really comparing apples to apples. On the upside, you may learn about some restaurants you have never heard of before. In the two lists above, there are 13 restaurants of which I have never heard. That means I will be asking around, getting more information and perhaps checking a few out for myself. So, the bottom line for Yood? If you are in a strange town, it can help you make a choice about where to eat, but it may pull up a fast food establishment when what you are searching for is a little more upscale or vice versa. It is possible it may give you a suggestion farther away when there is a really good choice that is closer. You can offset that by customizing Yood to find suggestions based on location rather than rating. If you don't want to have to think, Yood may be the perfect app for you. And you can always click again for another suggestion, if you want a little more control over the situation. Finally, because Yood is free, you do get to watch a riveting advertisement every now and then. It is not perfect, but definitely worth checking out and adding to your other restaurant apps.